Philips has introduced the 221S3UCB, a 21.5" LCD display that connects to your PC with a single USB 2.0 cable that supplies both power and image. The screen has white LED backlight technology and consumes as little as 8W. It features a 1920 x 1080 pixel resolution, 150 nits brightness, 1000:1 contrast ratio, and 160° (H) / 150° (V) viewing angles. The display should be available in retail stores for 145EUR (excl. VAT). 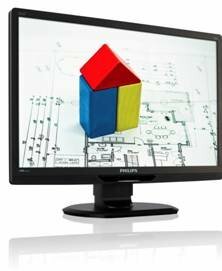 MMD, the leading technology company and brand license partner for Philips Monitors, today released a new 21.5-inch monitor powered through USB. With a single USB 2.0 cable supplying both power and digital video, the new 221S3UCB LCD monitor is an innovative notebook companion that provides office and mobile workers with the flexibility of a second display they can plug in whenever extra screen space is needed – but without the extra clutter of yet another power supply unit. Busy professionals have fewer components to keep track of – and busy offices have lower energy bills. A quick look in the desk drawers of just about any office reveals plenty of power supply units and connection cables belonging to long-gone devices. The new 221S3UCB, the latest member of the Philips S-line for business professionals, makes an impressive contribution to power and cable efficiency in and out of the office. It’s plug-and-play at its best: there’s no need for VGA or DVI cabling (with their more inconvenient “plug-and-screw” connections), and no need for an additional power socket either. The new 221S3UCB does way more than keep the office tidy, of course. Being powered by USB, it also opens up new opportunities for viewing “on the go”. Mobile workers can present to clients, or work on huge spreadsheets that need every inch of screen they can get. Or how about watching a movie on 21.5-inch full HD – without a power socket, and without messing with cables that never seem long enough! A notebook will usually be able to provide power to two monitors without an external power supply, but in the event more screen space is needed, USB 2.0 connectivity makes it easy to hook up additional screens back in the office. Since the monitor does not require an external power adapter, it eliminates at a stroke one component that takes a real toll on the environment: the power supply unit. This alone makes a huge difference, but the display does far more. For energy-efficient operation, it uses special low-power LED backlight, which is what makes it possible to draw power from a notebook PC. In fact, the display consumes a meagre 8 watts – that’s around half the power consumption of an equivalent standard monitor. And, like all Philips monitors with LED backlighting, the latest member of the S-line family is mercury-free, which makes for an eco-friendly lifecycle from assembly to disposal. An eco-friendly monitor must set equal store by the welfare of users. What about actual physical comfort, and ways to combat desk fatigue? To take the strain off users during long working sessions, the 221S3UCB features the Philips Compact Ergo Base: not only does this enable the monitor to tilt and swivel, it is also height adjustable, so users can position their display to the perfect viewing level. With so much care lavished on power savings and clutter-free convenience, it stands to reason that the new 221S3UCB monitor will deliver an awesome viewing experience to match. The White LED technology ensures the display lives up to its promises, lighting up faster to full, consistent brightness and delivering excellent dimming control and a super-high contrast ratio with superior colour reproduction.